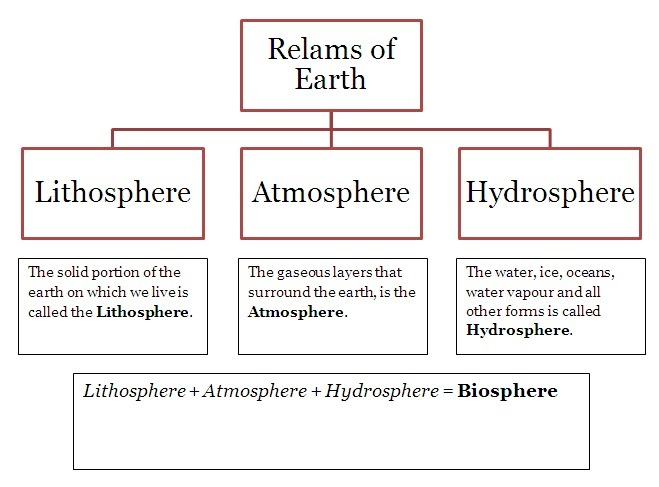 Realms of Earth means the major domain of the earth in which it is divided into 3 sphere. We live on the solid portion of the earth and it is called Lithosphere. Whereas, the ocean and other forms of water available on the earth is Hydrosphere. The surrounding air and we breathe is called Atmosphere. 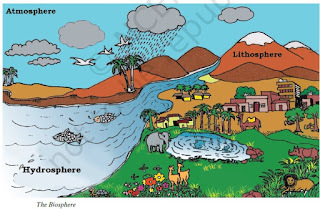 Lithosphere is divided into 7 continents- Asia, Africa, Europe, North America, South America and Antarctica. Our Earth is divided by an Imaginary line called Equator. The Upper part of the is called Northern Hemisphere and the Lower part is called Southern Hemisphere. Most of the Land part of the earth lies in Northern Hemisphere. Asia is the largest continent of all. It covers about one-third of the total land area of the earth. The continent lies in the Eastern Hemisphere. The Tropic of Cancer (23.5 degree North) passes through this continent. Asia is separated from Europe by the Ural mountains, the Caucasus mountains and the Caspian Sea in the west. The combined landmass of Europe and Asia is called the Eurasia (Europe + Asia). It has the highest Mountain peak- Mt Everest (8848 m in height). Africa is the second largest continent after Asia. The Equator or 00 latitude runs almost through the middle of the continent. A large part of Africa lies in the Northern Hemisphere. It is the only continent through which the Tropic of Cancer, the Equator and the Tropic of Capricorn pass. The Sahara Desert lies in the North Africa and The Kalahari Desert in South of Africa. This continent has the largest river called Nile, the longest river (6,853 km) in the world. Nile river end into the Mediterranean Sea in the North of Africa. North America is the third largest continent of the world. It is linked to South America by a very narrow strip of land called the Isthmus of Panama. The continent lies completely in the Northern and Western Hemisphere. Three oceans surround this continent- the Pacific Ocean, the Atlantic Ocean and the Arctic Ocean. It also has Rocky Mountains in its west region. South America lies mostly in the Southern Hemisphere. The Andes, world’s longest mountain range, runs through its length from north to south. South America has the world’s largest river, the Amazon. Antarctica, completely in the Southern Hemisphere, is a huge continent. The South Pole lies almost at the center of this continent. As it is located in the South Polar Region, it is permanently covered with thick ice sheets. There are no permanent human settlements. Many countries have research stations in Antarctica. India also has research stations there. These are named as Maitri and Dakshin Gangotri research center by India. Europe is much smaller than Asia. The continent lies to the west of Asia. The Arctic Circle passes through it. It is bound by water bodies on three sides. This highly developed continent and They have their own union called Europe Union. The large proportion of a level and well watered lowland mostly in the central part and have been bought under cultivation. Hill slopes and all those lands are not very much fertile nor quite level, hence used for pastures. Australia is the smallest continent that is entirely in the Southern Hemisphere. It is surrounded on all sides by the oceans and seas. It is called an island continent. The earth is called the Blue Planet. 71% of the earth is covered with water, including rivers, lakes and ponds. Out of this, 97% is found in the ocean and have high amount of salinity, not safe for humans to drink. Only 3% is available for fresh water. Most of the fresh water is in the form of glaciers in Antarctica. The five major oceans are the Pacific Ocean, the Atlantic Ocean, the Indian Ocean, the Southern Ocean and the Arctic Ocean. The Pacific Ocean is the largest ocean and has the deepest trench at Mariana Trench depth of 11,022 m below the sea level. The Atlantic Ocean is the second largest Ocean in the world. It is ‘S’ shaped. It is flanked by the North and South Americas on the western side, and Europe and Africa on the eastern side. The coastline of Atlantic Ocean is highly indented. This irregular and indented coastline provides ideal location for natural harbours and ports. From the point of view of commerce, it is the busiest Ocean. The Indian Ocean is the only ocean named after a country, that is, India. The shape of ocean is almost triangular. In the north, it is bound by Asia, in the west by Africa and in the east by Australia. The Southern Ocean encircles the continent of Antarctica and extends northward to 60 degrees south latitude. The Arctic Ocean is located within the Arctic Circle and surrounds the North Pole. It is connected with the Pacific Ocean by a narrow stretch of shallow water known as Bering strait. It is bound by northern coasts of North America and Eurasia. The earth is surrounded by a layer of gas is called the Atmosphere. It provides us with the air we breathe and protects us from the harmful effects of sun’s rays. The atmosphere extends up to a height of about 1,600 kilometres. The atmosphere is divided into five layers based on composition, temperature and other properties. These layers starting from earth’s surface are called the troposphere, the stratosphere, the mesosphere, the thermosphere and the exosphere. Troposphere is the most important layer of the earth. Its average height is approx 13 km and 17 km measured from mid-latitude. contains approximately 75% of the atmosphere's mass and 99% of its water vapor and aerosols. All weather phenomena occurs in this layer only like rainfall, thunder storm, hail storm. The temperature decreases as we go up- 1 degree Celsius at 165m above. Stratosphere is second layer of the atmosphere. Its average height is 50 km from the earth. Ozone layer lies in this layer. This layer is clean from clouds and hence, ideal way for flying planes. The temperature increases as we go up. Mesosphere is the third layer of the atmosphere. It lies above the stratosphere. It extends up to the height of 80 km. Meteorites burn up in this layer on entering from the space. Thermosphere is the layer where ionsphere is present and helpful in communication. In this layer, temperature rises rapidly as we go up. This layer extends from 80-400 km. Exosphere is the upper most layer of the atmosphere, beginning at 500 to 1,000 kilometres (310 to 620 mi) above the Earth's surface, the atmosphere turns into space. This layer has very thin air. Light gases like helium and hydrogen float into the space from here. Comments "Conceptual facts of Major Relams of the Earth"